The publicity firm 5WPR is under the microscope after someone associated with the company impersonated a rabbi. NEW YORK (JTA) -- The public relations firm trying to restore the image of the embattled kosher meat producer Agriprocessors is wrestling with a controversy of its own after being accused of impersonating online a leading critic of the company. The New York-based agency, 5WPR, is accused of making a fraudulent posting to several Web sites in the name of Morris Allen, a Conservative rabbi who also heads the movement's ethical kashrut initiative. 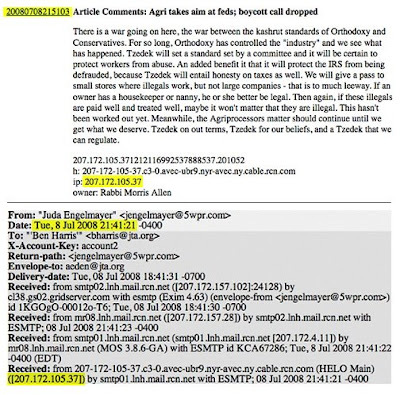 Two of the postings appeared at FailedMessiah.com, a blog that is highly critical of Agriprocessors, the largest kosher meat producer in the United States. The blog, operated by Shmarya Rosenberg, reported Wednesday that the two comments in Allen's name came from Web, or Internet Protocol, addresses registered to 5WPR. Later in the day the blog quoted the 5WPR executive handling the Agriprocessors account, Juda Engelmayer, as saying he had been unaware of the fraudulent postings. Engelmayer blamed the postings on an intern, whom Engelmayer said was subsequently fired. A separate fraudulent comment was posted to the JTA Web site from what appears to be Engelmayer's home. The comment, by someone purporting to be Allen, was posted Tuesday at 9:51 p.m. to a JTA article about Agriprocessors. It came from the same IP address as an e-mail that Engelmayer sent 10 minutes earlier to two JTA employees. That IP address, which is different from the one that FailedMessiah’s Rosenberg tied to 5WPR’s offices, is a residential consumer Internet connection on the Lower East Side of Manhattan, where Engelmayer lives. A person identifying himself as the intern in question but refusing to provide his full name called JTA on Thursday to say he posted the fraudulent comment to the JTA site using a computer at Engelmayer’s apartment during a get-together there Tuesday night, but without Engelmayer’s knowledge. A fraudulent comment posted to the JTA Web site, above, and an e-mail from an executive at 5WPR had the same origin I.P. address. Ronn Torossian, 5WPR's founder and president, issued a statement to JTA on Friday, saying that his firm's "IT department investigated accusations which we have now learned to be true." "A senior staff member failed to be transparent in dealing with client matters. He has taken full responsibility," Torossian said. He added: "We have instituted internal measures to ensure this cannot happen again. We continue to strive for the highest ethical standards." The incident is shining a spotlight on one of the fastest growing publicity firms in New York. It also could hamper efforts by Agriprocessors to bolster its image. Since its founding in 2003, 5WPR has landed several major Jewish and Israeli clients. According to the firm’s Web site, in addition to representing several high-profile celebrities, it has worked for a number of Jewish organizations, including the American Jewish Congress, American Jewish Joint Distribution Committee, American Friends of Magen David Adom, Shaare Zedek Medical Center and the Zionist Organization of America. The firm has also represented the government of Israel and several Israeli political figures, as well as Pastor John Hagee, a San Antonio-based mega-church leader and leading Christian conservative supporter of Israel. Agriprocessors turned to 5WPR after federal authorities conducted a massive immigration raid May 12 at its packing plant in Postville, Iowa. Nearly 400 undocumented workers were arrested. Last week, two plant supervisors were arrested on charges that they helped employees use fraudulent documents to acquire jobs. The raid has unleashed a flood of negative publicity, including allegations that the company hired underage workers, tolerated an atmosphere rife with sexual harassment and underpaid employees. Agriprocessors has denied any knowledge of wrongdoing and suggested that it is the victim of selective prosecution by the federal government. In response to the growing controversy, Agriprocessors hired a former federal prosecutor, Jim Martin, as its compliance officer. In an e-mail to JTA, Martin said the meatpacking company neither approved nor authorized 5WPR's tactics. 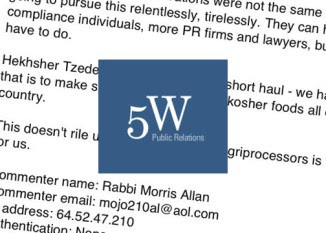 Since hiring 5WPR, Agriprocessors has held a conference call for community leaders responding to the allegations and taken out an advertisement in major Jewish newspapers headlined "The Agriprocessors Our Customers Know and Love!" Allen, a longtime critic of Agriprocessors, dismissed the public relations offensive. Hekhsher Tzedek, the ethical kashrut initiative he heads, was launched largely in response to allegations of worker mistreatment at the meatpacking firm that first emerged in 2006. Allen's purported comments were made in response to a blog item announcing that an Orthodox social justice group was calling off a boycott of the company. The group, Uri L'tzedek, said it was encouraged by "early signs of reform" instituted by the new compliance officer. "We're going to pursue this relentlessly, tirelessly," read a comment on the site attributed to a misspelled version of Allen’s name. "They can hire ten more compliance individuals, more PR firms and lawyers, but we know what we have to do. Hekhsher Tzedek is not in this for the short haul -- we have a goal, and that is to make sure that Tzedek is on kosher foods all over the country. This doesn't rile us. This is a cause. Agriprocessors is the drive for us." An identical comment was posted to the Web site Vos Iz Neias, which reports news about the fervently Orthodox, or haredi, community, setting off a string of invective from the site's largely Orthodox readership. Vos Iz Neias confirmed to JTA that the addresses from which both comments emerged is associated with 5WPR. The comment on the JTA site attributed to Allen called the controversy "a war" between Orthodox and Conservative standards of kashrut. "If an owner has a housekeeper or nanny, he or she better be legal," the post continued. "Then again, if these illegals are paid well and treated well, maybe it won't matter that they are illegal. This hasn't been worked out yet." Allen told JTA that he did not leave any of the comments and may pursue legal action against the firm. Michael Siegel, a Chicago rabbi and the national co-chair of Hekhsher Tzedek, said he has sought legal advice. "We are going to pursue all avenues," Siegel told JTA. "This is just a terrible statement on so many levels that we've come to something like this in the Jewish community. I don't know how much lower we can go in this whole thing." In his statement, Torossian cast his firm as playing a role in a religious struggle. "This battle is not about blogging, it is however about protecting the highest levels of Kashrut in the Jewish community. We as a firm feel personally and professionally passionate about these, and related issues," he said. "Critics of traditional Judaism have chosen to smear the largest provider of the highest level kashrut meat in the world. We stand with protecting kashrut."